Black Bloc starts riot at G20. Do real anarchists all wear the same shoes. Do they wear uniforms? The Law Union of Ontario Movement Defence Committee [MDC] has issued an Appeal for broad political support for the G20 arrestees, estimated at nearly 500. Not arrested were members of the supposed anarchist group, Black Bloc, which is suspected of being a police psyops group ordered to start the G20 riot yesterday. Among the protestors, two professional journalists were also reportedly beaten and one arrested. “The Toronto Police and the ISU appear to have lost control of their ‘prisoner processing center’, denying arrestees meaningful and timely access to counsel while beating and arresting those peacefully protesting their detention outside,” the MDC said in its press release today. 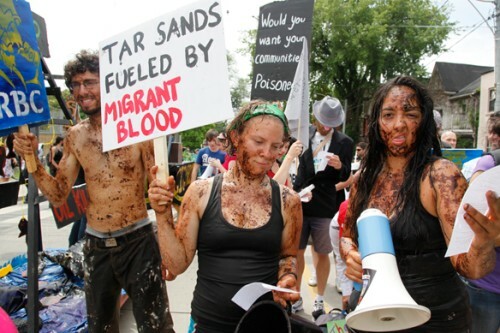 “[A]cross the country indigenous communities continue to resist government expropriation and environmental destruction of their land for mineral and resource extraction. “Meanwhile Canada intends to use the G20 to expand the free trade of these mineral and resource commodities…. While security for the event cost in the range of $1 billion, police were nowhere to be found when the Black Bloc began smashing windows and burning police cars, according to several on scene reports. 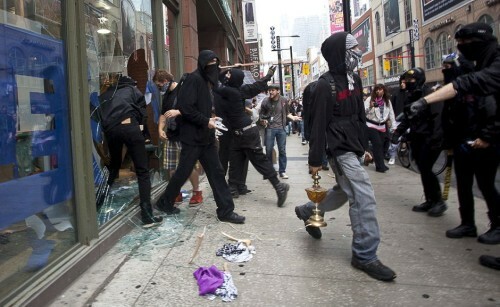 Supposed anarchist group, Black Bloc, damaged property at the G20 protest on June 26. Whether or not Black Bloc is a group of paid police provocateurs, at least one corporate media station in Canada, CTV News, assured its audience that the bulk of protestors behaved peacefully, calling it a party atmosphere. In response to police brutality, protesters sang O Canada, hoping to shame police into good behavior. While the G20 leaders planned to meet behind a steel cage and an unprecedented 1-billion dollar security operation, a contingent of thousands-strong protesters gathered to defy Stephen Harper’s Fortress Toronto. There are hundreds of groups here including many of the big names: Canadian Labour Congress, Amnesty, a couple COmmunist Parties, the UFCW, Greenpeace, CUPE and a host of other smaller groups. It’s amazing, there’s well above 10,000 people here. The largest previous G8 protest in North America was 3,000 people. For three hours on June 26 the heart of Toronto’s financial district was in the hands of 2,000 protesters. 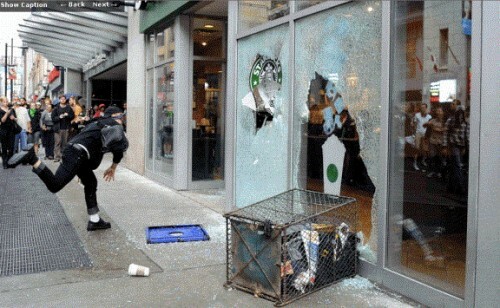 Store fronts and police cars were destroyed as crowds of activists laid waste to Bay Street and Yonge Street. The police response was poorly organized and did little to protect property or unsuspecting civilians (not to mention the activists themselves). (Positive video coverage) Police temporarily shut the gates to the G20 security perimeter early Friday evening, as they attempted to head off the largest in a string of demonstrations to protest the international meeting. Mohawk activist Ben Powless describes the scene at the Novatel Hotel at 1 am on Saturday night (online interview with Ben Powless). An estimated 150 peaceful protesters have been arrested; they were given no option to leave. June 26, 2010, Toronto, Ontario– After a large march and rally against the meeting of the G20, police attacked a crowd of peaceful protesters in Queens Park. The following clip shows police attacking and arresting protesters. This entry was posted in 4th Estate, Economy Economics, Environment, Human Rights Civil Liberties, NWO, Psy-Ops, Resistance and tagged corporatism, economics, g20 black bloc are agent provocateurs, G20 free trade, g20 riot psyops, Land Rights, profits vs people, resource extraction. Bookmark the permalink. Also see, $1 Billion G20 Brutality – Canada’s Shame for some excellent coverage of why folks protest the G20. Stupid article. This author doesn’t know the first thing about anarchism or black blocs. Just another conspiracy theorist who probably also thinks the moon landing was fake.